Habitat for Humanity Philippines (HFHP) has built over 42,000 houses in over 180 communities across the country for the past 25 years. 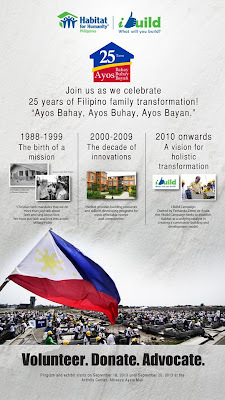 And as it commemorates its 25th year anniversary with the theme of Ayos Bahay, Ayos Buhay, Ayos Bayan, expect bigger and brighter social transformations as Habitat showcases it campaign “I Build My City, I Build My Philippines”. Yesterday, September 18, 2013 at the Activity Center of Abreeza Mall, Davao, HFHP gathered government and business leaders, volunteer leaders, affiliate members, and other organizations in a celebration of the partnership that has brought HFHP to where it is today. On its 25th year anniversary, HFHP embarked on a campaign entitled “I Build” aiming to develop a holistic community development program that can be replicated nationwide. And this year, HFHP announces an expansion of its campaign to “I Build My City, I Build My Philippines” which focuses on advocating for a city-wide shelter program for densely populated cities in the country. Through “I Build My City, I Build My Philippines”, HFHP targets to reduce the housing backlog of the Philippines by 20% by the year 2020. With the country’s current housing backlog of 4 million households, HFHP has a goal of assisting 800,000 families through on-site or in-city resettlement of informal settler families in urban areas, employee housing for the private and public sector, self-help housing in rural communities, and disaster preparedness and response. And last night, with key individuals who have been transformational in the success of HFHP in Mindanao, HFHP honored Department of Social Welfare Development (DSWD) in Autonomous Region of Muslim Mindanao (ARMM) for the houses and day care centers; Lutheran World Relief for supporting the Disaster Relief programs; and corporate partner such as NCCC Cares, ADTECH Events and Promotion Mangement Corporation and Rural Bank of Digos, Inc. According to Mr. Charlie Ayco, HFHP CEO and Managing Director, the foundation is very fortunate that with the help of their donors and volunteers, they have been able to reach thousands of Filipino families and build them new homes. But he pointed out that there are still a lot of things to be done. And for the succeeding years, HFHP is hoping to hand in hand with the national government, local governments, civil societies, businesses, and the youth sector to successfully develop and implement a city-wide shelter program in each city, in where they are hoping that through this, with proper zoning, HFHP will not only be able to build communities that are safe, resilient, and empowered, but also to reduce the number of affected populace during disasters. The gathering also featured the renowned Mindanao sculptor Mr. Kublai P. Millan, his work and his Balay Kalipay art pieces, which works are for auction. Lastly, the night was made more heartwarming by Pangkat Silayan Theater Collective as they performed a rousing musical number. For more information about Habitat for Humanity Philippines, you can check out their website www.habitat.org.ph, follow them on Facebook - Habitat Philippines, on Twitter - @HabitatPhils, and on Instagram - @HabitatPhils. Congratulations, Habitat for Humanity Philippines!